One vital question we receive quite often from both marketing executives and IT leaders is where exactly to sequence community in their digital engagement plans. Most organizations now realize that engaging more closely in social environments with their stakeholders is highly beneficial, both to the bottom line and strategically, and is potentially a zero-sum move they must use to head off competition. But they’re typically unsure when and where in their plans they should put community, and how much to prioritize it. However, as companies struggle with digital channel proliferation and the challenges of genuinely engaging at scale with their stakeholders to create shared value, the vehicle of digital community is increasingly found to be the most compelling option for dealing with these challenges. Communities have proven highly effective at spreading out the work amongst the members of a community, tapping into a more diverse pool of ideas, even leading important and complex business initiatives. More significantly, communities can reliably and repeatedly change the cost, velocity, and resiliency of the way businesses achieve their goals, despite being made up of stakeholders under much less direct control than before. In short, many digital strategists are coming to the conclusion that at most digital touchpoints for organizations today, it’s vital to have a company’s community well-integrated into the experience to make it substantially richer and more useful than it could be otherwise. In particular, as most companies are either developing or already have communities for some key stakeholders already, any effective digital strategy — typically segmented around the now-canonical paid-earned-owned model, will extend their reach into any relevant and useful segments of organization’s full digital stakeholder experience. For many organizations, companies are busy trying to stay on the digital treadmill, adding relevant channels as they emerge, and updating their comms, marketing, and engagement strategies as they go, often merely adjusting strategies to encompass new channels, rather than rethinking what the new channels do and what makes them potent new alternatives to old ways of engaging. This means online communities, which are somewhat unfamiliar and have their own unique rules, are often included later in the digital engagement process, or even worse, as a second or third tier player in a yearly digital plan. 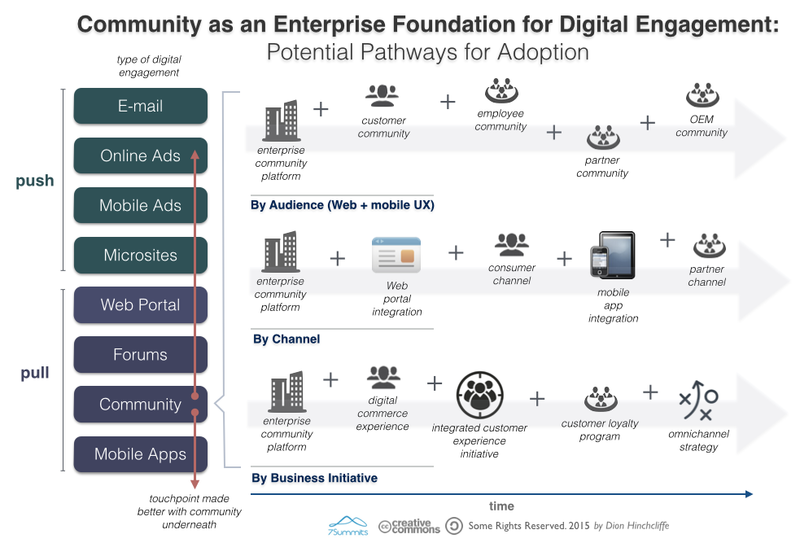 In our work, we’ve found that companies should generally opt to move communities more centrally into their digital engagement platforms, whether that is a customer community, enterprise social network for the workforce, or business partner support community. Thinking more strategically, even where digital engagement is more transactional in nature, such as e-commerce, advertising, sales microsites, portals, intranets, mobile apps, learning tools, or other solutions, these use cases often work much better if a company’s community is plugged into them, helping with questions, providing information, adding vital context, and so on, speeding up the transaction itself while building a stronger, long-lasting, better relationships with new and existing customers alike. Adoption community by audience. Now that companies are able to use one community platform for all stakeholders — see Salesforce Community Cloud for a class-leading example — companies can start with workforce, then add suppliers, business partners, customers, and the broader marketplace, building up staff and experience by reaching out to a broader group over time. Companies can change this order up as well, but the goal of this approach is preparing well for each audience as you bring them online. Adoption community by digital channel. Sometimes companies invest in digital engagement on a channel by channel basis. In this model, the company looks at new mobile channels, Web site upgrades, expanding microsite platforms, adding discussion forums, etc, in the order that each channel is upgraded or addressed, incorporating community, or more ideally, making it the foundation of that channel. Adoption community by business initiative. Certain organizations are much more driven by the business, and must organize around large initiatives that the business is leading. This is a powerful way to bring community online as the basis for these overhauled functions, with community forming the underpinning delivery platform. What powerful about this approach is that the community effort can leverage the prioritization and buy-in for the initiative to gain the resources and support required to succeed. This is not an exhaustive way of adopting community of course, but it offers an instructive set of options that shows that you don’t need to boil the ocean for digital engagement in most organizations. Instead, companies can craft a plan for adopting online community — and driving results with them — that most aligns with the way that they structure their digital engagement plans and upgrades. Just don’t forget to foster the requisite digital skills in the stakeholders that use these new engagement platforms, from the line worker to the leadership team, in order to get the best results.